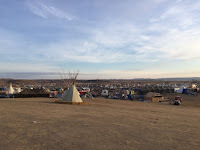 It has been a long time since I’ve felt the need to post something to my blog, but yesterday I returned from a short trip to Standing Rock and I just wanted to share what I saw and know. First, who am I? Well, I’m a person who likes water. Yes, I regularly drink the stuff. I was told as a young person that my body was made up of 57-60% water, and I was also informed that I could only survive for three days without it. Those things, along with hearing that one of the most pressing issues around the world, and in particularly third world countries, is clean water, makes it somewhat of a concern to me. I had heard bits and pieces about the Standing Rock protest. Native Americans protesting with prayer against a pipeline that would go under a clean water source that could, if it leaks, affect water supplies. Blah, blah, blah. The second thing you should know about me is, I’ve NEVER protested ANYTHING, ANYWHERE, EVER. Nope, I was a bit too young for the wars, or didn’t live in an area where things were happening, and never felt the need to go somewhere where things were happening. I am in no way of protester mentality. I am not a professional. 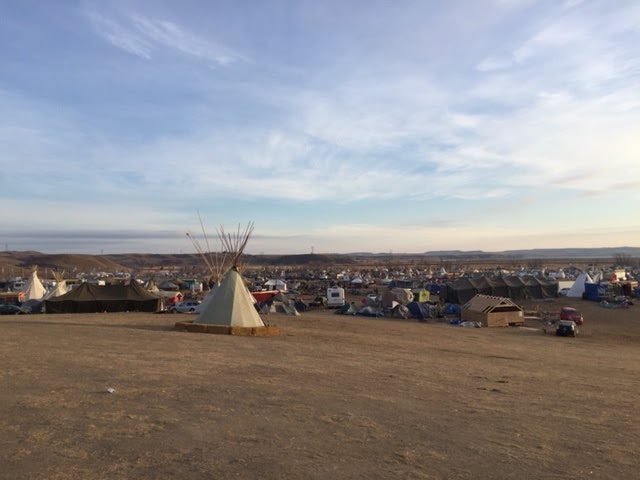 So what was I doing going to Standing Rock? Short answer: I brought some soup and warm clothes. A friend was going to deliver these things and I offered to drive. What I learned: Not only could a leak from this pipeline effect local native water supplies, well it could effect water supplies for a whole lot of people, indigenous and not, all the way across our country. Yes, there are a lot of existing pipelines that go across the United States, and some of these are getting old and are now causing problems. And really, the big issue here is our reliance on oil. Some people are all for this based upon jobs. This is what I know about the job market. Some people will win and some people will lose. Yes, there may be more job opportunities related to oil and the pipeline, but it could just as easily reduce the same number of jobs in transportation and other sectors. And let’s just be honest here, as a country we should be at the forefront of renewable energy. We are supposed to be a great first world country – how can we be stuck in an era of dependency upon oil? I was there for about 24 hours. 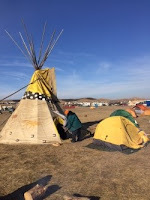 When we pulled into the main camp, I was surprised at the number of water supporters that had encamped there. Thousands of people from all over the United States, and the world have come. Thousands of people who were moved to join the support of clean water. Thousands upset over the fact that unarmed people were being hurt and fired upon for verbal protest – our right to free speech. During that time I froze! Yep, winter has struck the Dakota plains and it was cold. 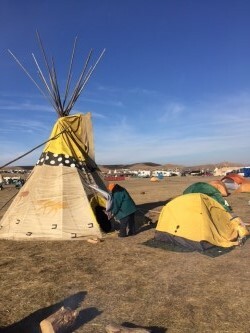 I was huddled under comforters and blankets in the back of my car, but I was not alone in being cold, many of the supporters were in tents and cars, also without heat or adequate warmth – the only difference was they had been doing it for days and weeks, they are not just quick overnighters like I was. I must admit to admiration for their cause. What did I do? Well, I walked the entire camp. I saw elderly, children and every age in between. I sat at the sacred fire and listened to women who spoke of South America and how their families had been impacted by pipelines that have now leaked and have caused problems for the Amazon River and those dependent upon that water for life. I sat on planning sessions for peaceful protests that would occur on Monday, when I’d be back at home and unable to participate. And I prayed. Yep, that is what I came to do. Pray with those people who love water, as much or more than I do. I prayed at the river, in camp, and by the fire. I prayed for the safety of those who were there. And I walked to the bridge that has been blocked, not by the water protestors, but by Militarized Police and National Guard. In fact, I was on that bridge when Tibetan flags were placed around the fence at the entrance. And then I left all that behind to return home. It was as I was leaving that I noticed the water cannon coming into the area. It was as I was leaving that we were told three vehicles with a number of armed men were heading our way. It was as I was leaving that my heart was heavy, as it appeared the camp would be in conflict. And it was as I was leaving that I prayed again, for the safety of all those I had met who just wanted to speak and pray and support clean water for all of us. When I woke today I saw the video of what happened last night. I was ashamed that I left to return to my life. I though how convenient that the National Guard and Militarized Police had the water cannon “available” to “put out the fire that the protestors started,” but it made me wonder especially when I heard the first hand accounts of the protestors as to the fact that they did not start the fire, but were attempting to put out the fire caused by those on the other side. It made me wonder why video that clearly shows what happened is not shown on any of the major network’s news channels. It made me wonder why they are NOT THERE. And so today, I cry for those I met and have left behind. I pray to support them and keep them safe. I will pray even harder that God might hear my prayers and protect our water, because after all, we are 65% water and cannot live more than 3 days without the stuff. we are still becoming grounded in our new reality. 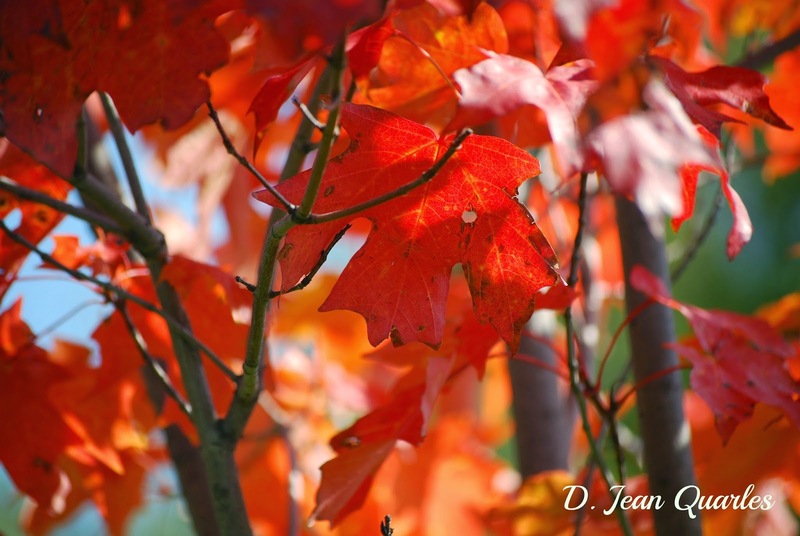 The days are shorter here, even shorter than the days we've become used to during our winters in AZ. Yet, still I'm finding blessings. Saturday I was fortunate to offer a ride to a neighbor I hadn't met before and in doing so was rewarded with this sight - the Canadian Pacific Christmas Train. They opened a boxcar and sang for the town. And Santa even attended long enough to hand out some treats to the little ones. Such a unique and wonderful experience. or maybe it's the cold. I do not know if any of my followers are still around. So I've come home after almost 40 years. part of the reason for the return is so I can write full time. as if for the coming home party of the year. Writing is a journey. One that opens the heart and finds the soul. Writing, for some, is like breathing. I find I fall into that category. I'm a writer of Women's and Young Adult Fiction. My Women's Fiction can all be found on Amazon.com, as well as other sites. Rocky's Mountains & Fire in the Hole both take their inspiration from Wyoming. While Perception is my wanders novel. My Young Adult Science Fiction Series is written with Co-Author, Austine Etcheverry. The title: The Exodus Series. Book I, Flight from the Water Planet and Book II, House of Glass can both be found on Amazon.com. Look for my latest novel, out this spring. While writing is a passion, no one can live on writing alone. I'm also a lover of reading, photography, & knitting. All photos displayed on this blog are original works by me. Please get permission for use. Thank you!